My faith has high and low moments these days. At times, I am confident it’s the only thing getting me through, and then I stumble upon this. I’m working on my bible study homework and I come across a verse I had highlighted, and I know exactly why. I sent this to my brother. Maybe more than once. I put my belief in it, and my expectations. You see, that’s the trouble: I expected a particular result when I read this verse, and I didn’t get it. I know the mature thing to do would be to move forward, confident that God is working on my behalf, just not the why I expected. But that’s kind of hard to do. I worried about Riley, and I tried to help him, and then I decided to give him over to God. I prayed for him, so often and so intently. I had my entire Bible Study class pray for him; often during my first three years at BSF and then weekly during 2015. At first my prayers were vague and open: help him, save him, make him better, make him okay. At BSF we talked about praying very specific things, and so my prayers became specific: help him find a place to live, help him find a job. For a time, it seemed obvious that all of our prayers were being answered. He would get a few more weeks at the place he was living, just when his time there was about to run out. I think that is when the expectations started. My mind filled in parts of the story for me. Now I believed that God would use Riley for a greater purpose. Specifically that Riley’s struggles would all be used to help him relate to and help others. He was going to get a job working in a kitchen. He would find a place to live somewhere near me. He would take the bus to work, sometimes stopping before or after a shift at our house to chase the boys around the yard or have a meal. I would pick him up when he needed a ride, or to prevent his waiting for the bus in the rain. He would save his money and we would scan Craigslist together, finding him an inexpensive car. He would joke about it being a piece of junk, but there would be pride in his eyes, and acceptance. He knew why he was where he was in life, and he was grateful to be there. I had no illusions that he was at the end of all of his struggles, but I did think the end was in sight. I expected to see him around my house, in my life. I expected to see him find his way. I expected that part of his trajectory would find him in a helping role, where he used his own experiences to relate to others. I expected him to be a success story. Why? Because my prayers were being answered. I expected the passage above to play out much differently. When I wrote those words in cursive on a sheet of lined paper, I had all the confidence in the world that they were true, of course, but I also had expectations of how it would play out. 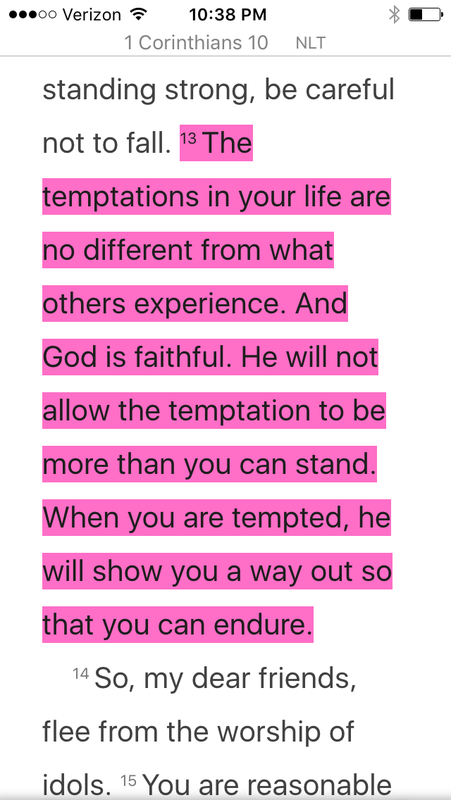 “He will not allow the temptation to be more than you can stand.” What a relief. “When you are tempted, He will show you a way out so you can endure.” When I encountered this verse again I felt let down. I felt guilty for sharing this so confidently with my brother. As though I had found the right verse and that verse would save him. I expected it to. Reading this last night I wanted to turn away. I was not sure how to respond to the disappointment i felt. A thought crossed my mind; that perhaps God had shown him a way out…but I couldn’t stomach it. My thoughts swirled angrily around my head until at last I fell asleep. It meant something very different to me last week when i read it. 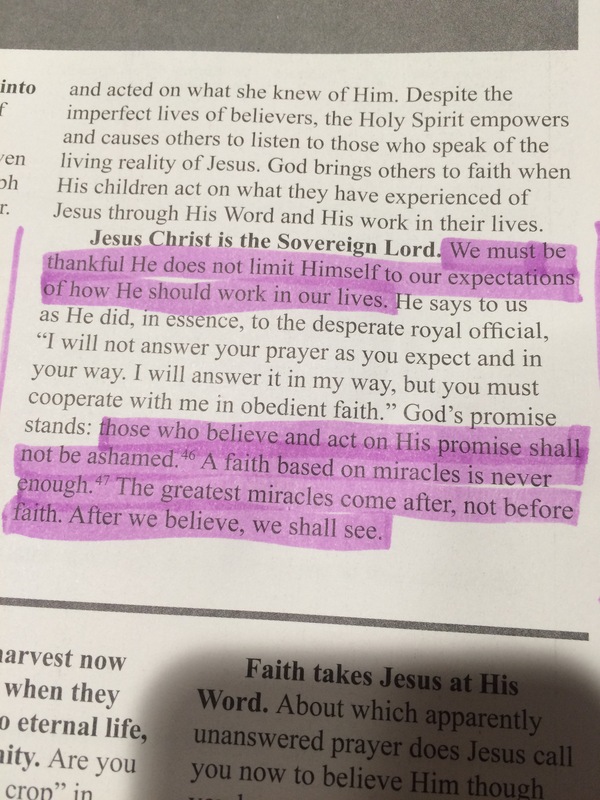 “We must be thankful that He does not limit Himself to our expectations of how He should work in our lives.” I expect that is much easier to do when one is delighted by an outcome. We can thank Him for His creativity in how He answers our prayers. We can be grateful that He does what is best for us, and isn’t limited by what we ask for. We are limited by our own life experiences and imaginations, and He is not. But how do I respond when the outcome is so horrible? This result has been painful, excruciating. Do I thank Him in it? I was happy to thank Him for His creativity when, just in the nick of time, Riley would get more time at Phoenix house. He would be spared homelessness for one more week. I would reflect on how God gave just what Riley needed, but He doled it out slowly, one day at a time. I suppose I got carried away in that momentum, the slow ride of blessings as I saw them. My worry lessened and I began to live in faith, confident that I would get what I needed each day. Just enough, and no more. Until the day Riley died. I didn’t expect that at all. I could have told you that it was an option, but in my heart I felt like I knew what God had in store, and it wasn’t this. I had to question everything: my purpose here, God’s love, my intuition, my faith. I have been on a journey of soul-searching that is far from over. I would have kept him here forever, you know. My heart knew how difficult his battle was, but it wouldn’t have given up on my vision of my life with him in it. I made a plan for his life and I expected to see it play out. I felt like this would happen because I had included God in the plan and told Him about it. Of course, that is not the way it works. I do not, at this point, expect to ever understand why any of this happened. I just don’t know. I can’t tell you why God performs miracles for some and withholds others. I can’t tell you why bad things sometimes happen to good people, or why my prayers weren’t answered, at least not in the way I expected. I can philosophize and theologize on and on about our fallen world and the pulls of evil, but in the end I have to face my own inner fear. If God didn’t save Riley, does that mean He heeds my prayers at all? Is He listening? Was I wrong to tell Him how I wanted things to go? Should I be less specific, less bossy? Should I pray at all? I want so badly to find a purpose in all of this. I feel as though I need one to legitimize my own suffering. I no longer expect that purpose to make itself known to me, but I have faith that it exists. When all else fails I fall back on what I know to be true: that I will see Riley again, and that God is good. Life is hard, but God is good. On the days that I feel unmoored, I ground myself in the things I know, and let the “whys” and “what-ifs” float slowly away. He will use these things for my good, whether this was His plan or a tragic outcome of our sick society. Life is hard. I have so many questions that will remain unanswered. I fix my eyes on what I know and let the rest float away. This entry was posted in Addiction, brother, Faith and tagged Addiction, battle, Bible, brother, coping, death, expectations, faith, God, grief, loss, riley, struggle, unknown. Bookmark the permalink.